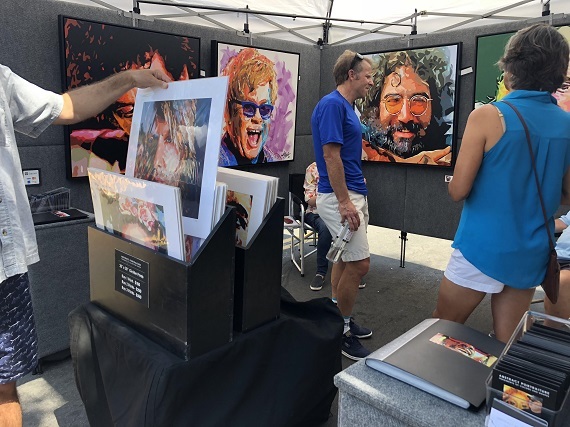 Held on the second Sunday every August, The Carlsbad Village Association's 21st Annual Art in the Village will take place on Aug. 11, 2019. This event will bring over 100 local and regional artists for a one-day, open-air event. Celebrating the dynamic art culture in Carlsbad Village and the surrounding areas, the event attracts locals and visitors, and a diverse selection of fine artists in mediums such as oil painting, watercolor, photography, mixed media, new media, classical and contemporary sculpture, as well as artisans who work in the mediums of jewelry making, woodworking, furniture, pottery, and hand-painted clothing and accessories. Starting at 9 a.m. attendees can browse exhibits and listen to live music along State Street and Grand Avenue right in the heart of the Village, just blocks from Carlsbad State Beach. We are pleased to have the Family Open Studios, hosted by the City of Carlsbad Cultural Arts Department, providing art-making projects for the whole family again this year. Also this year we will feature the artwork of young, up and coming artists in our Student Art Pavilion. Live demos, live music, and more! Public parking is plentiful in the Village and the beach is only two blocks away. Numerous casual and fine dining establishments are within steps from the venue, as well as shopping at a wide variety of boutiques, salons, and galleries. Artists interested in exhibiting may email keller@kennedyfaires.com for additional information. Stay connected with us so you don't miss out on any CVA Village events by subscribing to our eNewsletter, or connecting with us on Facebook and Instagram. WE COULDN'T DO THIS WITHOUT THE HELP OF OUR GENEROUS SPONSORS.